Evolving from a simple notion that humans and plants are both ‘natural materials’ Human-Nature is an ambitious and multi-faceted season of exhibitions, talks, workshops and performances produced by Siobhan Davies Dance, an investigative arts organisation known for approaching choreography in a way that allows (if not calls for) challenging and interdisciplinary projects. Co-curated by arts producer Vicky Long and Alison Proctor (producer Siobhan Davies Dance) Human-Nature explores the complicated relationships we form with nature from an impressive number of angles: here, guerrilla gardening is programmed alongside installations made from locally sourced clay, and horticulturalists work together with artists. Whether you are a professed art-lover, a concerned environmentalist, or both, Human-Nature is guaranteed to tickle your imagination, challenge your preconceptions and maybe even make you consider nature in a new light. Eager to know more about the project, Run-Riot talked to Vicky Long: read on to get a first-hand introduction to the many exciting events that make up Human-Nature, find out how local and global feed into each other and why nature is not a destination to which we travel. Run-Riot: Welcome to Run-Riot! Before we dive into the intricacies of Human-Nature, can you tell us a bit about yourself and your background? How did you become involved in the project? Vicky Long: I have produced and curated work to do with climate change in the past. I led a four-year programme of work at the Eden Project in Cornwall, a collaboration with Cape Farewell. The programme brought artists, scientists and horticulturalists together to make work about environmental change, on site and in the surrounding area. 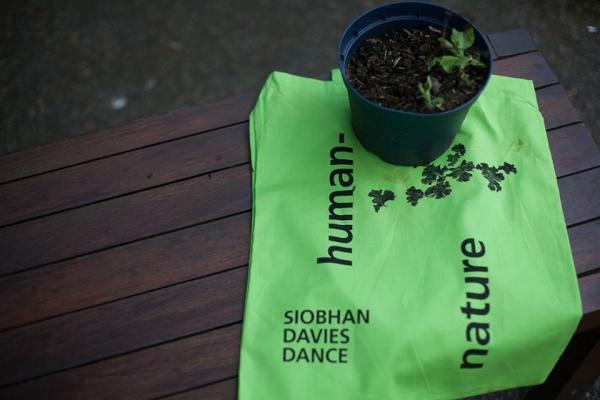 Alison Proctor at Siobhan Davies Dance knew about this Eden Project work and began to talk to me about her ideas for a year-long programme of plant-focussed work at the Siobhan Davies Studios a year or two ago. Run-Riot: Human-Nature brought choreographers, architects, artists and horticulturalists together, to work on projects inspired by the notion that humans are ‘as much natural material as plants’. Can you introduce us to the project? Where did the idea come from and what makes it urgent and relevant? Vicky Long: The idea was to invite artists (using the term broadly) to work with plants, a living material. Of course, choreographer Siobhan Davies works with live material all the time – dancers, performers, all of us derive from the earliest forms of life on this planet and we all play a part in its delicate ecosystem. Just as plants, we live, breath, grow, die - we wanted to draw a connection between our lives and the lives of plants, to remind ourselves of our dependence on these forms and of how the dynamics of the relationship between people and plants impact on our environment. Run-Riot: What was the curating process like? What did the dynamics of two co-curators bring about? What came first - the artists, activists and horticulturalists involved, or the specific projects that then inspired you to include specific people? Run-Riot: Human-Nature is part of the London Festival of Architecture. How does daring architecture fit into this relationship of people and nature? Vicky Long: Human-Nature explores ideas around Natural Capital, the natural assets held by the living world. Our most forward thinking architects are looking at ways of designing the built environment to make the most of these natural assets, to augment rather than reduce. It seems the smarter architecture becomes, the smaller the gap between the ‘built’ and the ‘natural’ world. Artist and architect, Christian Kerrigan, whose work opened and will close Human-Nature is especially interested in where and how these worlds meet. Run-Riot: While artists from different disciplines often collaborate, it’s not every day we see artistic projects inviting horticulturalists to join in devising and creating. What made you decide to take this route? Can you tell us about the experiences both the artists and horticulturalists had? How did this interdisciplinary approach feed into Human-Nature and its programme? Vicky Long: Alison was keen to celebrate the work of horticulturalists within an arts context. My work at the Eden Project had convinced me of the artistry involved in horticulture and I’d seen how exciting and productive bringing horticulturalists into contact with artists could be. We wanted to play a part in widening the view of what art can be at the same time as inviting new influences into the Studios. Commissioning landscape designer Daniel Lobb has allowed him to return to his sculptural roots and show his work in a gallery/studio setting. A project like Phytology, led by the artist and producer, Michael Smythe, couldn’t have flourished without the in depth knowledge leant by botanists at Kew. Richard Reynolds with Simon Whitehead have been collaborating together on a Mobile Meadow – Richard, known as gardener and Simon as an artist, have in fact each been fulfilling both roles. All of this has been fantastic to witness and support. We wanted to produce a programme which decreased the importance of labels and through which people were able to come together with ease, to share ideas, expertise and create something new. Run-Riot: Several of the curated projects engage directly with the area of Elephant and Castle, where Siobhan Davies Dance is based. Why was it important to take the global environment issues and project them onto a local plain in an often-disregarded part of central London? Vicky Long: In ‘A Global Sense of Place’ the geographer Doreen Massey invites us to think of places not as areas with boundaries around them, but to imagine them as ‘articulated moments in networks of social relations and understandings, constructed on a far larger scale than what we happen to define for that moment as the place itself, whether that be a street, or a region or even a continent.’ She argues that this allows ‘a sense of place which is extroverted, which includes a consciousness of its links with the wider world, which integrates in a positive way the global and the local’. Elephant and Castle is undergoing major regeneration at the moment. The decisions its developers take will have local, national and international consequences. A group such as Richard Reynolds’ Mobile Gardeners began by guerilla gardening in the area at night, but now the group gardens plots of land given over to them by the developers. Through sheer persistence they have contributed to keeping green and community matters at the heart of the regeneration and we wanted to connect to and highlight this creative activity. Run-Riot: There’s a real insistence on local materials and resources throughout Human-Nature, whether it’s local clay used by a ceramicist, or local produce used to make a lunch. Was the direct correlation of globalisation and environmental issues a subject you wanted to explore? How does the local interact with the global in the programme? Vicky Long: It was important to us to draw attention to the ground beneath our feet, the food growing in an allotment nearby, the plants blooming in Siobhan Davies Studios courtyard… Nature is not a destination to which we travel, but is all around. We have a choice about the degree to which we connect with it or encourage its presence in our urban lives. London depends on daily supplies from around the planet and its waste production and carbon emissions mean that its footprint is also global. Conscious of this, we created a programme which is intended to celebrate local production, but we have not wanted to hold up the local over the global but rather demonstrate the continuum between the two. Run-Riot: The programme also includes participatory projects, including harvesting and guerrilla gardening. Why did you decide to include these projects in the programme? What do you hope the audiences will take from these experiences? Vicky Long: We didn’t want this programme to be without the involvement of audiences and we wanted it to offer the chance for touch, smell, the engagement of the senses. Last week, children at Charlotte Sharman School, located just behind the Studios, helped us to plant a 12 metre high ‘edible wall’ in the stairwell of the Studios. Every child, from age 4 to 11, was completely engrossed in the activity, handling seeds, watering cans and getting their hands dirty. This was a brilliant thing to watch, and it was so interesting to see the way in which hierarchies disappear when everyone rolls up their sleeves and gets on with the collective task at hand. I hope the participatory projects in the programme will help to bring those that make the work and those that experience the work together on an equal footing. After all, we all end up in the same ground! Run-Riot: Finally - can you recommend something from the programme for our readers who might be more in the know when it comes to arts than when it comes to nature? How about the other way around - something for all our green-fingered readers who might not be the most frequent art-audience? Vicky Long: I’d like to highlight a few of our talks. For those more familiar with the Arts, please come to Tony Juniper’s ‘What has Nature ever done for Us?’ and if you can’t, read his book by the same title - you’ll never see the world in the same way again. For the green-fingered, please come to Ackroyd & Harvey’s ‘Radical Growth’ and find out about the large scale architectural interventions this artist duo have made, greening our city in astonishing ways.